Mine dewatering / filter aids are specially formulated surface active agents that help reduce the moisture content of mineral concentrates during filtration and subsequent storage applications. These products normally reduce the surface tension of water so that water is easily removed from mineral surfaces during filtration and storage. Dewatering / filter aids are widely used in all wet mineral processing applications where improving moisture content of filtered cakes is desired. Application areas include both sulfide and non-sulfide minerals processing and as well as coal cleaning. Dewatering / filter aid dosage requirements vary widely based on the application. Dewatering / filter aids can be applied neat or in diluted form and points of application in the process must be carefully selected. It can be added to spray water applications onto filter cakes during filtration so that filter wash efficiency is improved, or added directly into the mineral or concentrate slurries going to filtering processes and even to centrifuging. ArrMaz offers various mine dewatering / filter aids for different dewatering applications. Our filter aids improve mineral concentrate filtration for better filtration efficiency, and our dewatering aids reduce the moisture content of mineral concentrates resulting in improved drying of concentrate for storage and transportation. These products also improve water recovery and water efficiency in wet mineral processing applications. ArrMaz’s expert field personnel are available to our customers’ engineers, production managers and operations personnel as process advisors for dewatering applications. 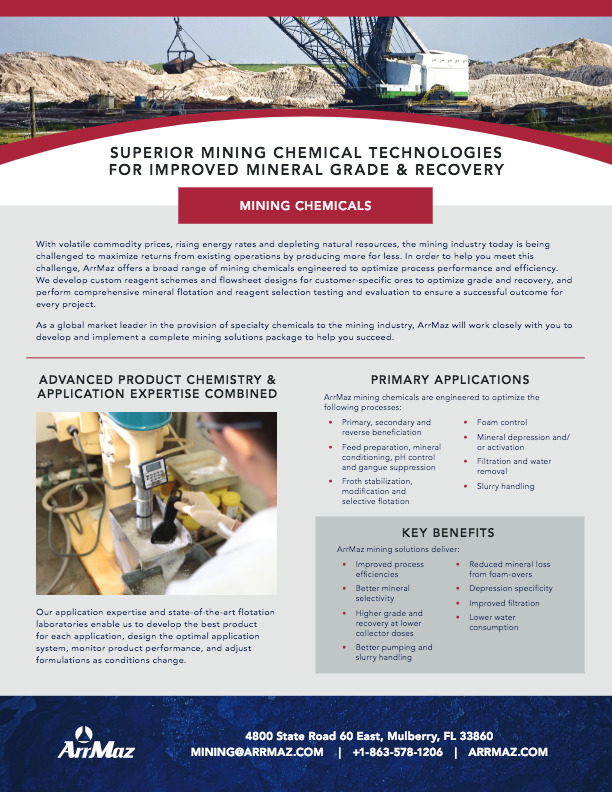 We will examine your mineral dewatering needs and filtration system from beginning to end, and develop the best chemistry and application system to improve your operational efficiency.